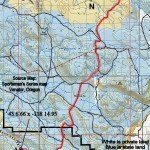 See an overview map of Desert Trail segments from Highway 78 to the Canada border here. 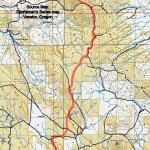 This segment leaves Highway 78 in Oregon near Summit Springs and heads cross-country across state and BLM high desert lands before joining the Juntura-Riverside Road for a few miles. After crossing the Malheur River it climbs back up to travel cross-country through high desert all the way to Drinkwater Pass. 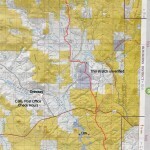 This segment is primarily across hilly sage and juniper country. I saw mule deer, chukar, bighorn sheep, coyotes and antelope. There are often good views and you should be able to see the Blue Mountains on a clear day. 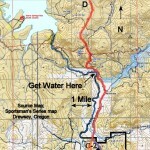 I found no drinkable water from the river to Drinkwater Pass. There are springs plotted near the route between the Juntura Road and Highway 78, but that stretch is a reroute and has not been scouted yet. 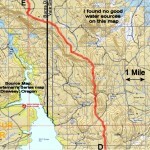 As roughly plotted digitally the Warm Springs segment is 57.6 miles long. Allowing for real-world twists and turns it is closer to 66 miles. This segment is plotted on Google Maps below. 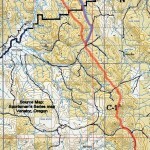 You will also find maps that you can view online or print. This is a route, not a trail and there are no markers. View Desert Trail: Warm Springs Segment in a larger map where can download the .kml file if you want and convert it for use with most GPS units.